The beautifully designed graphic features silhouettes of active space probes. The Spaceprob.es website also features info about active space science probe missions, plus stickers and posters for sale. Space.com appreciates unique efforts to highlight the awesomeness of space science, which is why the online project Spaceprob.es caught our eye. 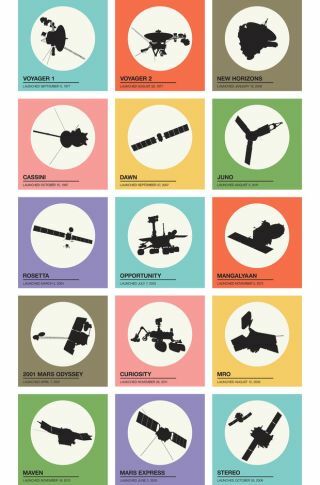 It's a one-stop-shop website for learning about all the human-made space probes currently studying the cosmos — plus, the site features sharp graphic designs of all the probes, available as posters and stickers.. The Spaceprob.es website features a list of all the active probes in space, with a short description of where they are, when they launched and what they're doing. The site also has a great graphic design element: instead of regular photographs of the probes, each machine is shown only as a sharp, black silhouette, framed by a colorful rectangle. The choice to feature only the silhouette of the probes emphasizes that these machines all have their own unique, recognizable shape. The designs can be purchased as stickers or posters of various sizes that can be bought alone or framed. So you can decorate your space with artistic images of Voyager 1 and 2 (exploring the edge of the solar system), the Mars Curiosity Rover, New Horizons (rapidly approaching Pluto) and 26 others. The website was created by two space-science enthusiasts and outreach specialists. Ariel Waldman is the creator of Spacehack.org and the global director of Science Hack Day. She is also part of NASA's Innovative Advanced Concepts Program, which "nurtures radical, sci-fi-esque ideas that could transform future space missions," according to Waldman's website. She sits on the NIAC External Council, which is "a small group of visionaries, from quantum physicists to science fiction authors, that advise the program." Lisa Ballard makes Web apps for the NASA Planetary Data System, Rings Node, at the Search for Extraterrestrial Intelligence (SETI) Institute, according to her about.me website. She is also the creator of the DailyRings twitter account, which features daily photos of planetary rings. The Spaceprob.es stickers and posters are a cool and easy way to fill your space with space.